*The morning began at KHS with some training for a cool thing teachers and students participated in at school today. Google was at the school with an Augmented Reality program that students used throughout the day. 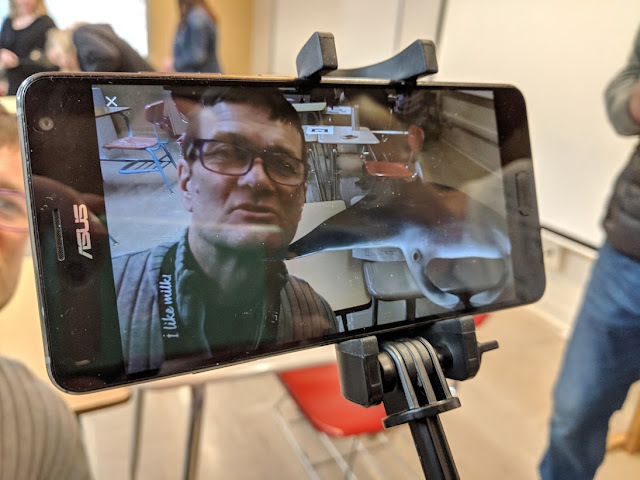 The way it works is students take an old cell phone on a selfie stick, and scan a QR Code, and then they can see images through the phone that appear in the classroom. I saw things throughout the day like ocean fish, sharks, planets, inventions by Leornardo DaVinci, paintings, sculptures and the skeletal system. It was pretty cool! *It was a rather unconventional day at KHS today. The day before spring break begins is always an interesting day. I was glad when the end of the day came, and I was able to head home and officially begin SPRING BREAK!! *Yesterday when I was setting up Netflix with my new Firestick, I changed the Netflix password. Throughout the 24 hours following the change, I received identical texts from each of the girls. Did you change the Netflix password? I sent them all the new password. I also had some good visits with Cosette and Zoe on the phone when I got home from work. It was good to catch up with both of them. *We had a really nice Maundy Thursday service at church tonight. As I listened to the story of Jesus washing the feet of His disciples, and humbling and serving them in this way, even serving Judas, who He knew was going to betray him, a question went through my mind. Could I wash the feet of someone who has betrayed me? Could I have unconditional love toward someone who I know purposefully wronged me? My answer is, no, I, alone cannot love such a person. But, with the help of the Holy Spirit, I can allow the fruit of the spirit, love, joy, peace, patience, kindness, goodness, faithfulness, gentleness and self-control to rule in my life and then, as I let God’s spirit work through me, I can love that person. I can’t do it on my own. One of the things Jesus told his disciples as The Last Supper was ending was, “A new command I give you: Love one another, As I have loved you, so you must love one another. By this all men will know that you are my disciples, If you love one another.” This is the Easter message. That Jesus sacrificed Himself on the cross for all our sins, then rose from the dead, conquering death, then leaving His Holy Spirit to guide and direct us, and fill us with God’s love so we then can love the unlovable people in our lives unconditionally. I can’t will myself to love the unlovable. I need help. I think we all need help. Christians have the power to be the most loving people on the planet. But I don’t think, collectively, we are often viewed as loving people. I pray that changes, and that loving your neighbor, with the help of the Holy Spirit, becomes the number one priority in those who profess to be Christians around the world. *I am not sure I have ever prepared lamb chops. Maybe one time. a long time ago. Yokes had some lamb chops for sale this week, and I bought a package. I covered them in olive oil, oregano, salt and pepper, and broiled them on each side for about 7 minutes each. They were delicious!! I will definitely add lamb to my meat list in the future! !